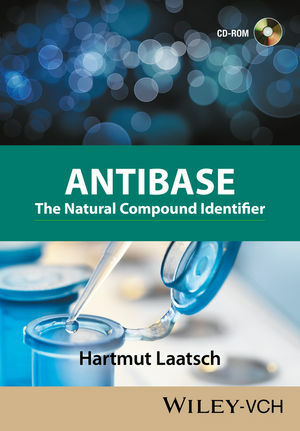 AntiBase is a comprehensive compilation of natural products, featuring properties of more than 43,700 compounds. AntiBase provides researchers with a convenient way of checking if a compound with antimicrobial effects has already been studied, and also provides insights into biological activity correlated to structural information. Antimicrobial activity is a key feature in translational and precision medicine, making AntiBase an indispensable tool for emerging genomic and metabolomic research. This library compares published data from literature with experimental values from the user by using a dragnet search. AntiBase includes compound property (molecular formula, mass, elemental composition, compound class), physico-chemical (melting point, optical rotation) and spectroscopic data (UV, 13C-NMR, IR, HRMS and mass spectra). Data has been collected from the primary and secondary literature, and then carefully checked and validated with most key references and source information provided as a data field. A unique feature of AntiBase is access to predicted 13C-NMR spectra for those compounds where no measured spectra are available. As an NMR shift search can easily be combined with a substructure search, this spectral data further enhances the power of AntiBase to easily differentiate between similar compounds. The predicted NMR spectra have been produced by Wiley's proprietary NMR spectrum prediction algorithm and are of high quality.